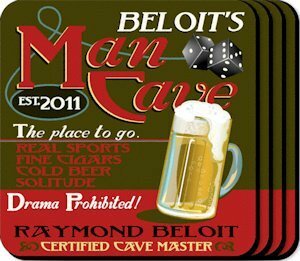 Here's a great place to set your cold frosty one while you're hanging out in your Man Cave! Each coaster is personalized with first and last name of the certified cave master and the year his cave was established. Full-color coasters come in a set of 4 in a caddy. Other notations on the mug include: real sports, fine cigars, cold beer and solitude. Drama is prohibited in this man cave!